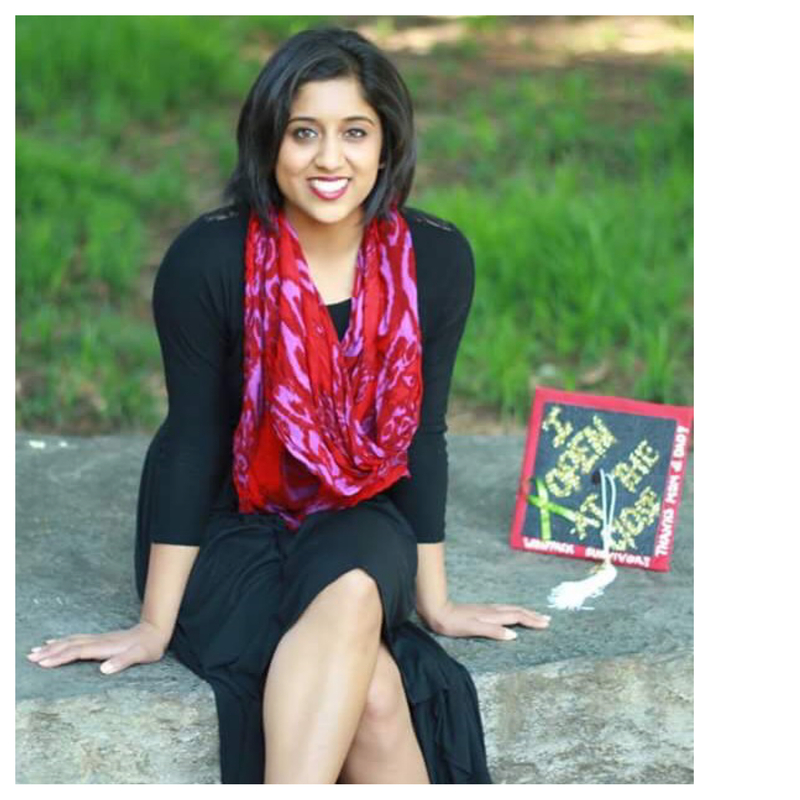 Neerali Patel, a graduate of N.C. State, received a B.S. in Biology and is now at UNC Chapel Hill for her Masters in Public Health. She chose this career path because she believed that Public Health gave her the opportunity to engage in various aspects of the medical profession, without being “right or wrong,” and because everything is equally relevant to people’s everyday lives and the planet. This field’s purpose drives her to change the world. Currently, she is interning at Carolinas Healthcare System's headquarters in Charlotte, with the Innovation Engine which is basically a small team that does strategic internal consulting for system. Besides dancing, she loves to spend time with my family and friends, write, and read/watch Harry Potter. I have been dancing for 20 years now. It may sound cliche, but it really is the only way I can express myself without any judgement. Try to imagine a dream where you are completely free of all of your worries, all of your stress, all of your responsibilities- THAT is what dance means to me. What styles of dance do you do and why? I am professionally trained in Bharatanatyam, but I have also done Latin, tap, jazz, bhangra, and contemporary. What team(s) have you been on and what made you join them? I am an alumni of NCSU Nazaare. To be honest, originally I did not want to do it. I kind of did it because I felt like I had to and people kept pushing me. Looking back at it, I am really glad I did. What struggles have you faced in your life? I was diagnosed with Hodgkin's Lymphoma, three days before my senior year of college. I decided to withdraw and take a year off to do chemo. It is funny how things get put into perspective when you go through something difficult. One second I was trying to figure out what graduate schools to apply to, the next I was shaving my head and prepping myself for weekly infusions. The funny thing is that out of all the things I had to be upset about, the most upsetting and heart wrenching thing was that I could not dance. Nazaare was relatively new, and that was the year they became an actual team and I was so angry at myself and at the world that I could not be a part of it. When they won first place, the captain dedicated the win to me. It meant the world and acted as a small ray of hope. I was confident at that point that I would be able to dance again. How has dance helped you face this adversity? I was very lucky. Not many people can have cancer, finish chemo in a year, and then start dancing six months later, but I somehow managed to do it. The team was great. There were a lot of new people but they were all so loving and understanding. That year we decided to make our theme about my story. I was terrified and hated the idea mostly because I was scared of the audience's reaction. I did not want us to do the theme because I was not sure if the circuit was ready for something so serious but the two captains did everything they could to make me feel comfortable with it. I am glad we did it. It was kind of a coping mechanism. I was constantly reminded of what I went through everyday when listening to the mix, but it forced me to accept what happened to me and move on. It forced me to accept my new identity as a cancer survivor. I could write an entire article about how amazing this team and experience was but I'll refrain. You really never know what is going to happen in your life. Even when everything seems so predictable, I can promise you that something unexpected will pop up and throw you off guard. I would dedicate a quote for every chemo I did and my favorite one was "That which does not kill us, makes us stronger." I try my best to live by this everyday and I think more people should live by it as well. What advice do you have to share with other dancers? I would periodically stop dancing because I did not think I had it in me to be a great dancer, and it is something I still struggle with, but I would advise anyone who is just starting out to keep dancing no matter how hard it is or how "bad" you think you may look. If it makes you happy, then who cares if you are not the best right?